Within ten years of its formation in 1900, East Kilbride Golf Club had moved from Show Park to a new home at Blacklaw, where another 9-hole course was brought into use. 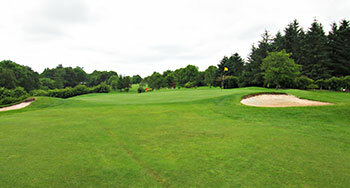 By 1923, another thirty-eight acres of land had been acquired, allowing the club to fashion an extended 18-hole layout. During World War II, only the greens were maintained (with grazing cattle allowed to roam the course) then the Army requisitioned the clubhouse. When hostilities ended, the club struggled on for almost a decade before a 9-hole layout was eventually recreated, opening in 1956. This course would prove to be a temporary arrangement because the club upped sticks once again in 1967, decamping to a new site at Nerston, where Fred W. Hawtree was tasked with laying out a modern 18-hole course for the members and this layout is still in play today. Playing to a par of 71, with an overall yardage of just over 6,400 yards, the course occupies an undulating site on the northern periphery of the New Town. Fairways are configured as two returning circuits, where each nine ends in front of a new clubhouse that was built in 2011, replacing the one destroyed in a fire the year before. The two most difficult holes on the course are both par fives that play uphill in the same general direction and into the prevailing wind. The first one, “The Horsey Gill” at the 529-yard 7th, veers left to the target whilst the second one, “Law” at the 496-yard 13th, bends right to the green. Rest assured, not many will card a “5” at both of these tough holes. I have played East Kilbride a number of times with a member there. I have always found the course to be in great condition and the greens a pleasure to putt on. It has the feel of a great members club with there always being other golfers on the course when I've visited. The layout flows very well with very few long walks from greens to the next tee. There are many tree lined fairways but you always get a sense of where you are on the site. The course has a variety of shorter and longer holes, however is possibly just missing a few more shorter par 4s to really aid the playability for the handicap golfer. However, I don't remember water being in play anywhere and the course is certainly not over bunkered. There are a few elevation changes on most holes, without any real unpleasant hills. The 2nd is a great hole, a downhill par 4 with the green tucked away on the right. The short par 3 3rd, sticks in my mind as an excellent one shotter. As well as the short par 4 16th, which plays to an elevated green. I remember the 11th being a particularly tough par 4, with a slopey fairway being very tricky to find and perhaps bordering on the unfair for many with making the green in 2 almost impossible for a lot of handicap golfers. The course has some excellent green complexes with sloping greens very much a feature. I have always enjoyed my golf at EK and look forward to returning. Having several friends who are members here I have played East Kilbride on many occasions. Unlike most courses which grow on one after a few rounds EK has had the opposite effect on me. The phrase 'a long slog' might have been coined with East Kilbride in mind. After a long, straight i.e dull opening hole the high points of the round come early in the shape of the unusual downhill 2nd and the pretty little 3rd. There is some competition for the dubious accolade of worst hole here but the 5th is a prime candidate - a drive into a hillside followed by a blind second shot! Other than the dogleg 6th the rest of EK is mostly an exercise in monotony including no fewer than three uphill par 5s all played in the same direction! A candidate for Scotland's silliest hole lurks at the 11th - head-scratching guaranteed! As you huff and puff your way up the endless 18th you may well count your blessings that this particular golfing ordeal is coming to an end. It may be the case that East Kilbride is a fine course for top golfers - Mark Warren and Craig Heap both originate here- but for the average player it is too hard and even lacks the pleasing views on offer elsewhere in the county. East Kilbride had never been on my intended playlist but when it made a recent appearance in the Lanarkshire Best in Region rankings I just had to investigate further. It’s apparent very early on from the quality of the build that this a modern track of some distinction and I wasn’t at all surprised to discover later on that it was designed by Fred Hawtree in the late 1960s. The fairways are basically laid out on a hillside, with almost half the holes doglegging one way or the other from tee to green. The par fives at the 7th and 13th are rated stroke index 1 and 2 for very good reason as they both play uphill and into the wind so a net “5” on the card is far from assured. I thought the four par three holes were very good, varying in length between 131 yards and 193 yards, with “The Nook” at number 10 the best of these short holes. When I played a few weeks ago at the end of June the fairways were rather lush and the course felt a lot longer than 6,402 yards off the back tees so I can understand those who might think the course is a bit of a beast because you certainly have to hit it long and true in order to score well. I still have two of the current Top 10 Lanarkshire courses to play before I compile my own personal ranking list for the county but I strongly suspect East Kilbride will feature prominently as it’s a fine championship standard track that deserves wider recognition.